This is a short article I wrote for the March/April 2016 edition of the Sportsman's Alliance of Maine (SAM) Newsletter....ENJOY! Late May, brings with it hordes of hungry salmon and togue, intoxicated by newly available forage and driven wild by hunger, after the desolate winter season. Despite their wanton desires to fill empty bellies and replace depleted fat reserves, this does not mean, that the fish are always biting and hungry. Last season, our first day of fishing was marked by incredible action, spurred by a titanic eruption of Hendrickson mayflies that whipped the salmon into a feeding frenzy. In a day of trolling the lake from sunrise to sunset, from the Grand Lake Stream Village landing to Hardwood Island and concluding at the mouth of Whitney Cove, we succeeded in bringing 20 salmon to the boat. Most fish were between 15-17 inches and included one well-fed football shaped monster that succeeded in registering 18 inches. Our second day was considerably more difficult and the salmon needed A LOT of “convincing” to elicit strikes. Through trial and error, we managed to get several average salmon into the boat, finally hitting gold with any lure containing the color “pink”. The remainder of the weekend was marked by high winds, cold temperatures and our last half-day of fishing, yielded not a single strike. As in all angling adventures, there are highs and lows, times when the fish bite and times when the “strikes” go cold. Show me a map of West Grand Lake and it would be difficult for me to indicate a specific spot where I have fished and not caught many fine salmon and togue including; Whitney Cove, the Throughfare, around Hardwood Island, Oxbrook, Pineo Point and many other locations. I am confident that when the fish are biting, anyone with a basic sense of direction and a good depth map will find success. West Grand Lake should not be trifled with any time of year but especially during the early season. Those wishing to fish its watery depths need to have a backup plan should weather turn dangerously nasty. The ice may have long since receded but unfriendly winds can still nip flesh and past trips have run the totality of extremes from arctic conditions, to sunny blue bird days spent lounging around in shorts and t-shirts. As the saying goes, this is typical of Maine weather and it is better to simply be prepared than second-guess what Mother Nature might decide to offer up. An alternative, when the weather turns wild on West Grand Lake, is fly-fishing Grand Lake Stream. The area below the dam on the West Grand Lake end of the stream is popular and can get crowded. Don’t be disappointed, most people freely offer advice on what flies are working and will help point you to fish. For a more tranquil experience, don’t be afraid to leave this area and thoroughly explore the stream, finding your own secret spots. If you are short on time and/or experience, the area lodges will happily assist you in finding a registered Maine guide to lead you around the stream and take you to the best pools. 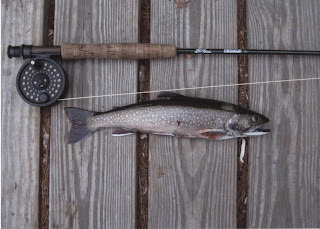 Fishing is often fast and furious during the first three weeks of April, with hungry salmon eager to bite hard on any imitation smelt patterns. Widely considered one of the top landlocked salmon rivers in the state, Grand Lake Stream regularly produces salmon of between 16 and 20 inches in length, with larger fish always an exciting possibility. Regulations set a length minimum for salmon at 14 inches and a one fish bag limit on salmon. The dam pool is by far the most popular (and also most crowded location) so those wishing for a quieter and more pristine experience, it is good to explore other areas of the stream. Fly fishing this time of year can be a struggle, as the combination of cold and wet takes it toll on those unprepared to meet the challenge. Cold water zaps heat from the body 25 times faster than air so it is critical that when fishing, care is taken to stay warm and dry. Maine’s spring is notoriously fickle and daily temperatures can range from below freezing to mid 60s. Being prepared with insulated waders, gloves, hand warmers, layered clothes, good food and hot coffee can make sure anglers remain comfortable as well as safe. A mistake made by many anglers is fly fishing with the same waders used during the summer. These waders are simply ineffective when compared against the larger and more insulated waders designed specifically for warmth and with over-sized boots to better accommodate heavy socks and heater packs. Feet are typically the area most susceptible to the wet and cold and even in the extreme cold, feet usually sweat and sweat will make feet damp and chilled. Wearing more socks will not make feet warmer but will instead impede circulation. Instead, a simple two-sock system should be used comprised of a thin nylon/spandex “liner” sock (no cotton), used to wick moisture away from the skin, and a second thick wool/nylon sock, for warmth. Care should be taken to ensure toes can still wiggle within the wader, as a restrictive fit inhibits blood circulation, making feet cold. On very cold days, chemical heat packs placed between the two socks provide additional warmth for very little bulk.